More than a third of marketing emails are being read on mobile devices, according to a new report from digital agency Steel London, who recommend that marketers need to now consider when and where their messages are opened to maximise opens and engagement. The report "Are your emails ready for mobile devices?" found overall, over a third (36%) of consumers in the UK now read emails on their mobile devices. Among 18-34 year olds this number rises significantly to over half (55%). 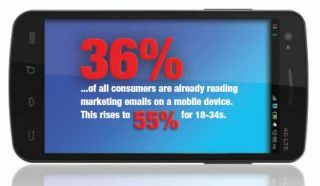 Steel's report found that 38% of those who read emails on their mobile device did so because the subject line sounded interesting. Steel recommends that marketers need to adapt their email marketing for mobile to ensure their marketing messages are easily read across a multitude of devices, but to also remember traditional email marketing rules still apply. 20% complain that links are not easy to use.